Sinus lifting is a procedure of re-growing bone in the posterior region of the upper jaw. In order to place an implant of an adequate length and width we need a sufficient amount of bone in the jaw. In addition to that requirement – the bone should be located in the areas we planned for the implantation. If there is not enough bone – its not possible to place a dental implant. The natural bone is lost following gum disease, after a traumatic extraction or due to bone resorption as a result of a long delay between the extraction and the implantation . In the posterior area of the upper jaw we restore the bone lost by adding an artificial bone- into the maxillary sinus – its called sinus lifting. Dental implants inserted into a good bone – will be integrated in that bone (Osseo-integration ) in 98%-100% of the cases. After the implant is integrated in the bone- the dentist is able to restore the missing tooth or teeth by- porcelain fused to metal crown, zirconia crown, porcelain bridge, removable denture retained by implants. The new bone is grown by inserting artificial bone particles or paste into locations where we need to improve bone quality and quantity for implants insertion. The bone could be of syntetic, bovine or human donor origin. There is also a possibilty to use patients own bone. Usually we cover the added bone by a protective membrane, a sort of artificial gum . The bone could be grown horizontally or vertically in both jaws. In most cases we can place the bone and the dental implant at the same treatment. In some cases- we have to wait 3-6 months before placing the implant. Re-growing bone vertically in the posterior region of the upper jaw is called – Sinus lifting , Sinus lift, Sinus floor augmentation. 1. Closed sinus lifting – small ammount of bone is needed . Bone is inserted into the sinus through the path prepared for the implant insertion. Usually we insert the dental implant at the same visit. 2. Open sinus lifting – larger ammount of the bone is needed – invasive procedure. A “window” is opened in the side wall of the sinus . The bone is inserted through it. In may cases we can place the implant at the same visit. If not- we wait for 6-9 months for the bone to grow before placing the dental implant. 3. 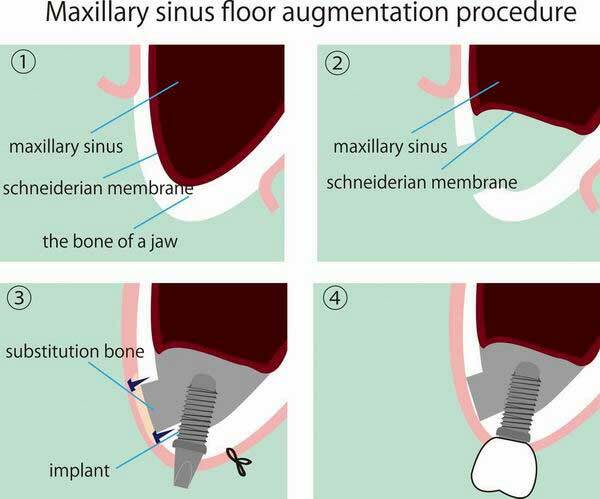 Minimally invasive sinus lifting – medium ammount of the bone is needed . The is inserted through the implant itself. The healing is faster. No major trauma to the tissues, less pain and swelling. In many cases bone augmentation or sinus lift can be avoided. Hightech in dentistry allows us to come up with extraordinary solutions in complex situations. Our clinic has vast experience in novel systems of dental implantations. Dental implant operations are computer planned and the implants are inserted by means of a computer guided surgical navigator, kind of bone GPS. This approach is also a basis of an All on 4 technique. This surgical GPS prevents the surgeons drill and the dental implant from damaging nerves, blood vessels and the sinus.